"Tim plays in a cool, relaxed style that is both inviting and invigorating... a jazz guitar player in the grand tradition of the great southern California jazz guitarists. His playing style is smooth, cool and unhurried, giving freedom of space that platforms the articulation of every note and phrase." NoHo Arts District Live Jazz ! Tim Moran brings traditional Jazz guitar to the NoHo Arts District in North Hollywood. 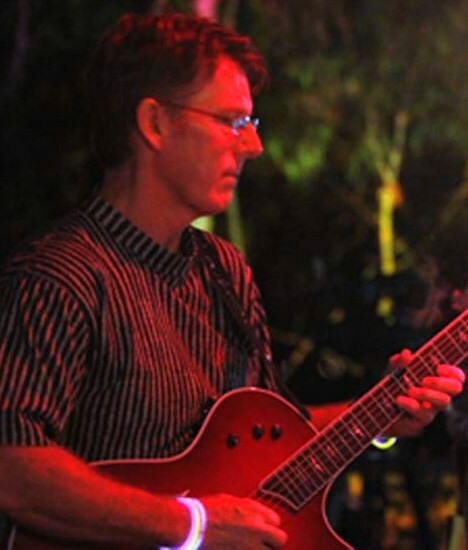 Tim Moran has been playing jazz guitar for more than 25 years. He studied with jazz legends Joe Pass and Howard Roberts and graduated from Musicians Institute (GIT/MIT) when it's curriculum was geared toward live jazz performance and budding studio musicians. Tim played guitar and bass on hundreds of LA area studio recording sessions during 1980s. Tim’s also an accomplished arranger and plays bass, keyboards and drums on many of his own jazz arrangements. Prior to attending Musicians Institute Tim studied music theory, performance and arranging at Washington State University. Tim's playing style was primarily influenced by horn players, vocalists and other guitarists including: Bird, Coltrane, Dizzy, Miles, Wes, Ella, Sarah Vaughan, Billie Holiday, Clapton, Page, Beck, BB King, Joe Pass, Stevie Ray Vaughan, George Benson, Tommy Tedesco, Howard Roberts, Pat Methany, Jim Hall and Pat Martino. All The Things You Are and A Foggy Day. 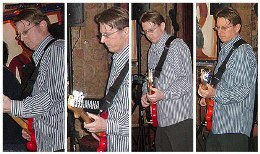 Tim playing bass at private party in LA's House of Blues Foundation Room. Tim performs and has recorded dozens of Jazz combo arrangements of Jazz standards ranging from "As Time Goes By" to "When Sunny Gets Blue". The theme of many of the selections is romance. Songs include "All of Me", "Isn't it Romantic", "All The Things You Are", "Misty" and "Body and Soul". Most arrangements feature Piano, Bass and Drums rhythm section with Guitar as the featured solo instrument.